In heaven, God told Adam and Eve they could have anything they wanted from his gardens, but under no circumstances should they take the fruit of the apple tree. Tempted by a snake, Eve took the fruit from the tree, which meant the couple were banished from heaven and their descendants would have to work and struggle to survive. My piece is a spin on this theme. God's gardens no longer exist, man has long time hidden in their cities, and has left nature to grow wild. Circumstances have made man have to go out in the open in search of answers. Is nature the answer? 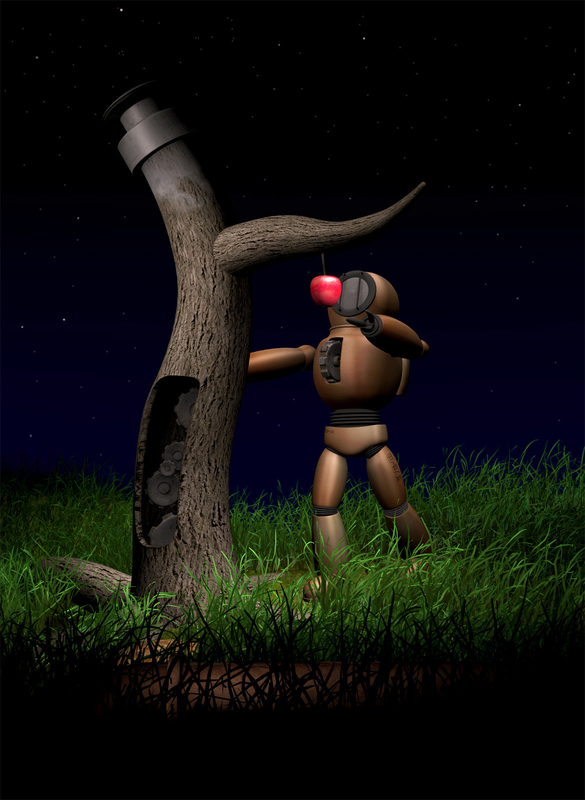 Maybe it was, but it no longer exists, and only clockwork trees remain... Eve should never have taken that apple... and the same mistake is about to be made again! This is my entry for the CGSociety Steampunk Challenge. Hardest part was probably coming up with the original idea and concept sketches. After that, it was just sticking to it. Had fun with the lighting and rendering, and achieved a little more experience with paint effects. C C's most welcome.